Brush Your Teeth The Right Way! Tooth brushing is such an entrenched habit. However, some people do get a little sloppy with this habit and can end up with gum disease and cavities. It turns out that there are numerous mistakes that many of us make while brushing our teeth both in the morning and at night. These mistakes can potentially harm our teeth, thus turning a healthy smile upside down! 1. 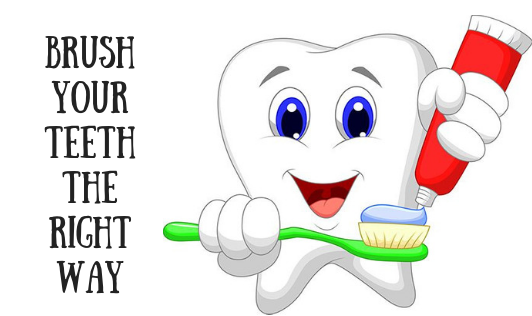 You brush after every meal or snack: Bacteria do build up in the mouth after eating a meal and while there is definitely no such thing as "too much brushing", brushing immediately after a meal can cause tooth sensitivity. This is because the environment within is still acidic. A strong rinse with plain water will suffice. Ideally, you should brush 30 minutes after eating your meal. Dentists usually advise that people who brush four times a day run the risk of exposing the root of the tooth and eroding the protective enamel. 2. Do you floss after brushing? Although many of us floss after brushing, this is not as effective as flossing before brushing because it opens up the gaps between teeth and allows the fluoride in your toothpaste to leach in better. 3. Your brushing only once or twice: In a gap of 14 hours between breakfast to dinner, there is enough time for the bacteria to build up. Brushing 30 minutes after a meal keeps those germs at bay. 4. Do you brush in circular strokes? Brushing in circular strokes can help clean your teeth, but some research says that it can slowly erode your gums. The best way to brush is by holding your toothbrush in a 45-degree angle and brush up and down. Keeping the pressure mild. 5. You're not cleaning your toothbrush properly: Replacing your brush in its cap soon after you finish brushing is a big no-no! If you don't clean your brush properly, the lingering bacteria on it can be worse than the ones in your mouth! Store your toothbrush upright and let it dry. 6. Do you rinse with mouthwash after brushing? Many of us use mouthwash soon after brushing thinking that it leaves the mouth cleaner. But the truth is that the mouthwash rinses away fluoride thus reinforcing the surface of the tooth. Use mouthwash at least 30 minutes after brushing. 7. Does your toothbrush has a large head? This can only make it hard for you to be able to reach the inner corners of your mouth, leaving you with lingering germs, terrible breath and eventually tooth decay. Make sure you use a brush with a small head and soft to medium bristles for optimal results. Make sure you keep these in mind the next time you're brushing!